NJLS Process Service handles requests not only in New Jersey but also all over the United States and the world, will full-time process servers using the latest in GPS (global positioning system) tracking technology, providing clients with online tracking and an instant view of the affidavit of service. NJLS Next Day is the lowest-cost provider of guaranteed overnight delivery service; with monthly service plans for as low as $3.24 per delivery, clients save as much as 80% compared to global carriers’ next-business day deliveries; all deliveries can be tracked online via the NJLS Client Login Web site. 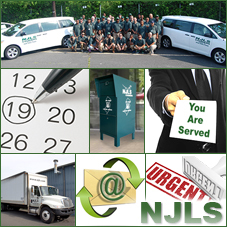 NJLS Drop Box Locations are an alternative with delivery guaranteed the following business day for as low as $3.24 with hundreds of drop boxes located throughout New Jersey, and a Sunday night pickup ensuring Monday delivery. Services Guide highlights the parameters for NJLS Next Day and NJLS Same Day, including standard vs. priority options and insurance offerings, and NJLS Process Service.